The <script> element either holds inline scripting statements, or it fetch an outside script file through the src attribute. <script> tag belongs to Metadata content, Flow content and Phrasing content. The "type" attribute is required. The "async" attribute not supported. The "async" attribute is new to HTML5. <p> tag id value has been defined as “para”. 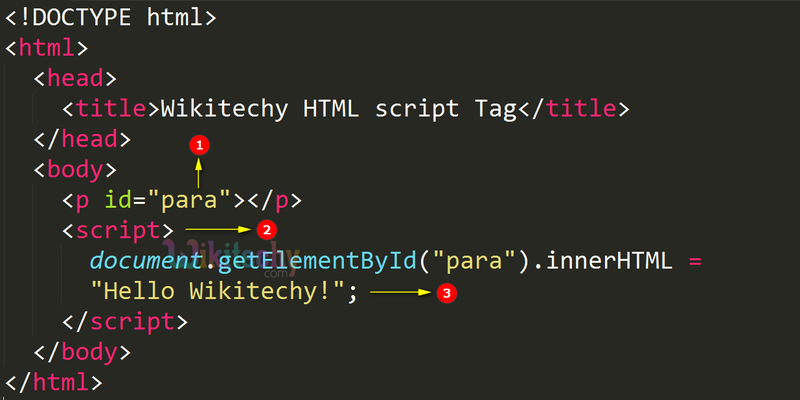 <script> tag is used to embed the executable script. The text Hello Wikitechy! will be included inside <p> tag which has the id as para. 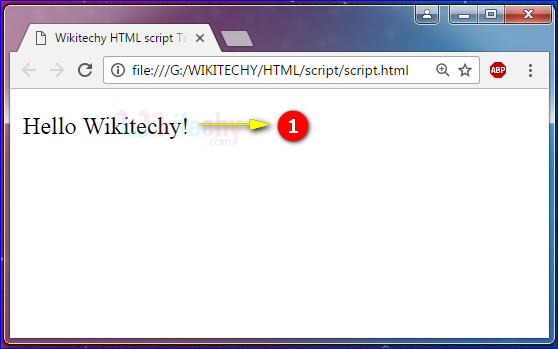 The text “Hello Wikitechy!” has been included inside <p> tag by using <script> tag. async async No Yes Defines that the script is executed only for external scripts. charset charset Yes Yes Defines the character encoding used in an external script file. defer defer Yes Yes Defines that the script is executed though the page has been finished parsing. src URL Yes Yes Defines the URL of an external script file. type media_type Yes Yes Defines the media type of the script. xml:space preserve Yes No Defines whether whitespace in code have been preserved. If the "src" attribute is present, the <script> element must be empty. async="async": The script can be executed while the page continues the parsing. defer="defer": The script is executed when the page has finished parsing. If neither async or defer is present: The script is fetched and executed immediately, before the browser continues parsing the page.